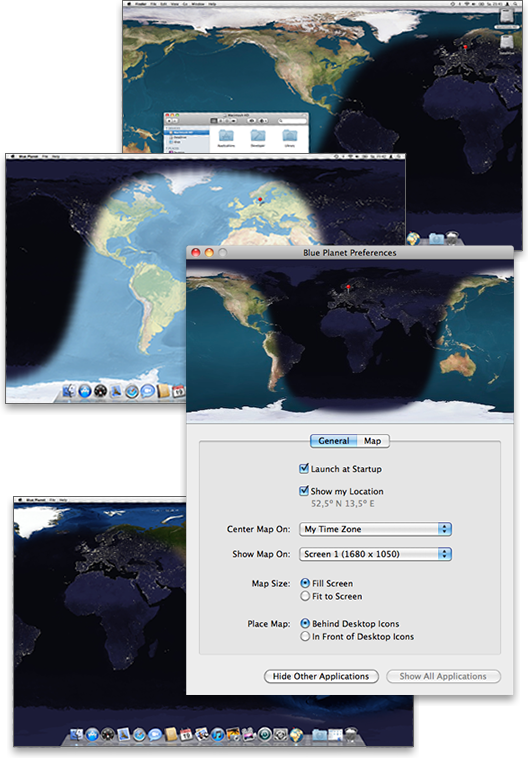 Beautiful Earth maps on your Mac desktop. Blue Planet replaces your desktop background with gorgeous satellite imagery of the Earth. The map's day and night areas change live as the day progresses. Planet Pixel Emporium by James Hastings-Trew. NASA Blue Marble satellite image from 2002. NASA Blue Marble Next Generation satellite image from 2005. 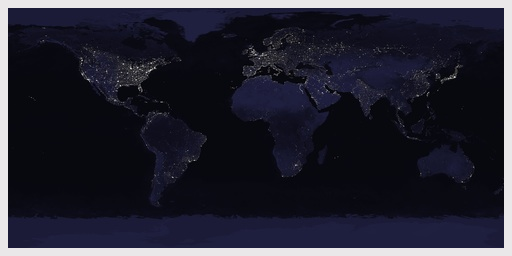 A beautiful image of Earth's city lights by NASA Visible Earth. Show your location on Earth. Using Apple’s Core Location technology (Internet access required). See how the sun moves across the sky. Day/night areas are updated in real-time. Optionally, switch to interactive mode to simulate any time and date. As the sun illuminates different portions of the Northern and Southern Hemispheres. Take screenshots of the map. Save a snapshot of the current map to an image file. Great for sharing via Facebook and Twitter. Live preview in Preferences panel. Choose the map you like best. Show the Blue Planet icon in the Dock and/or the menu bar. Center the map on your location or have it always follow the sun’s tracks. 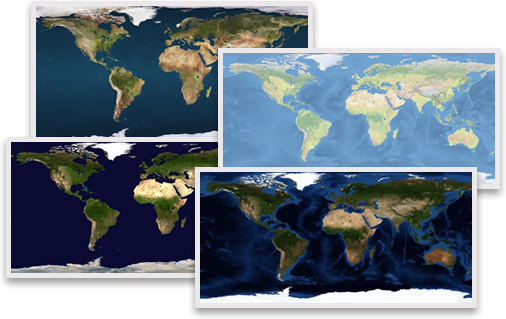 If you have multiple monitors, select the one Blue Planet should use. Optionally launch Blue Planet automatically when you start up your Mac. 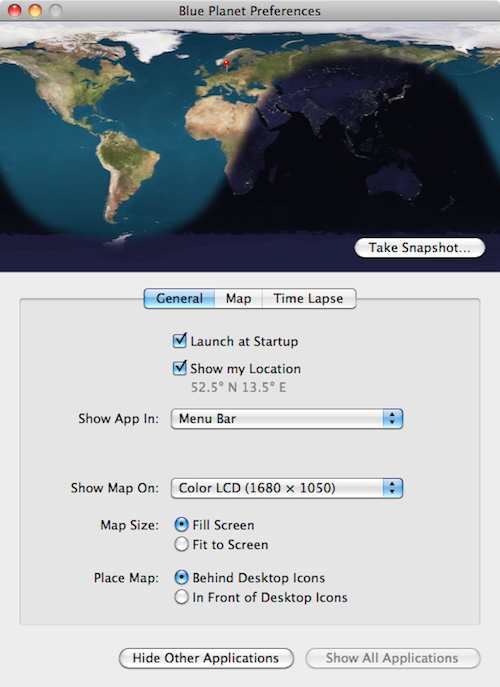 Show the entire Earth (with black borders) or fill the screen. 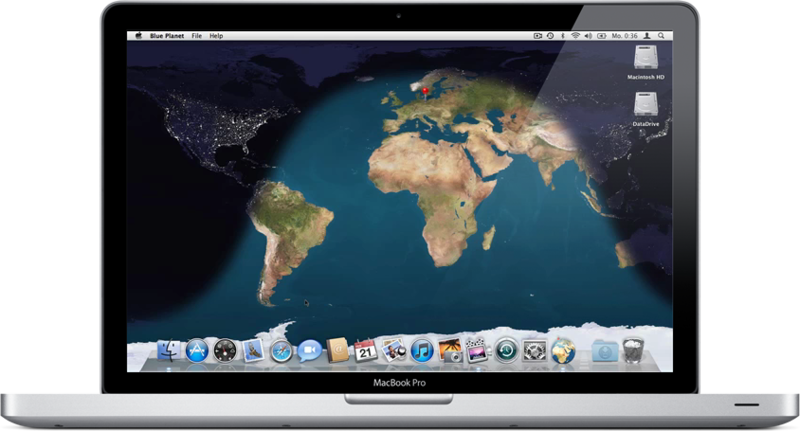 Have the map cover the icons on your Desktop (for a clean look) or place it behind the desktop icons. Requires Mac OS X 10.7.4 or higher and a 64-bit Intel Mac (which is pretty much any Mac shipped since late 2006). Fully supports Macs with high-resolution retina displays. Please follow me on Twitter at @olebegemann. Or subscribe to my blog. Or check back in the Mac App Store from time to time. Copyright © 2011–2012 Ole Begemann.